xxiii, 178 p. : fold. map ; 24 cm. A facsimile reproduction of the 1827 ed. with an introd. and index -- by Herbert J. Doherty, Jr.
Photoreprint of the ed. printed for Tanner, Philadelphia. A facsimile reproduction of the 1827 edition with prefatory material, introduction, and index added. 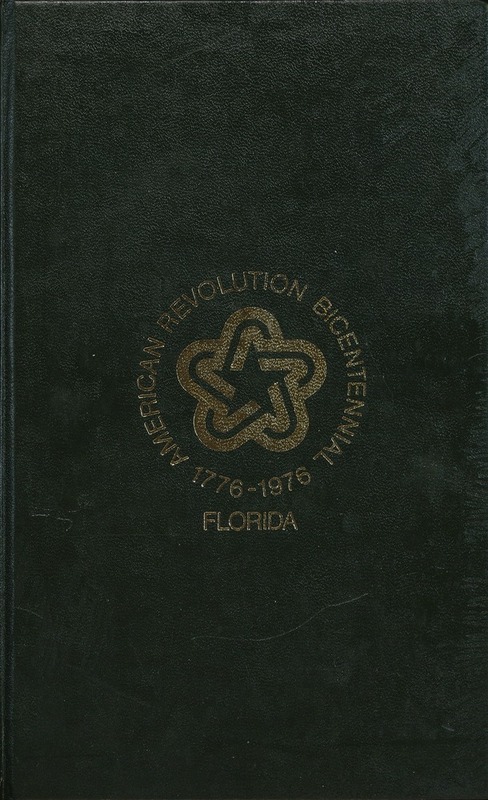 New material copyright 1976 by the Board of Regents of the State of Florida. This work is licensed under a modified Creative Commons Attribution-Noncommercial-No Derivative Works 3.0 Unported License. To view a copy of this license, visit http://creativecommons.org/licenses/by-nc-nd/3.0/. You are free to electronically copy, distribute, and transmit this work if you attribute authorship. However, all printing rights are reserved by the University Press of Florida (http://www.upf.com). Please contact UPF for information about how to obtain copies of the work for print distribution. You must attribute the work in the manner specified by the author or licensor (but not in any way that suggests that they endorse you or your use of the work). For any reuse or distribution, you must make clear to others the license terms of this work. Any of the above conditions can be waived if you get permission from the University Press of Florida. Nothing in this license impairs or restricts the author's moral rights. BY HERBERT J. DOHERTY, JR.
A view of west Florida. 1. West Florida-Description and travel. I. Title. 1823 to select the site for a new seat of Florida government. Florida to determine where the capital should be located. formation turned this exploration into a difficult undertaking. need for books and reliable maps of Florida was obvious. tine in East Florida and around Pensacola on the Gulf. along with lumbering, turpentining, and hunting and fishing. a frontier in every sense. and experiences, are the most important parts of his book. of Florida he had learned in the span of a few years. of Florida for the Florida Bicentennial Commission. to the scholarship of Florida history. Florida and chairman of the Department of Social Sciences. 1828, by James Gadsden, in the North American Review. declared that the map was based upon the "admirable"
survey maps in the General Land Office in Washington. and was engaged in business there for a number of years. that was rapidly becoming Americanized. Judge Henry M.
outpost fairly thoroughly during October and November. River. On present-day maps it appears as Fishbone Creek. now called the Steinhatchee (pronounced Steenhatchee). 1837 map now appears to be the Fenholloway. mately correct on both maps. is not nearly so extensive as that delineated on modern maps. the surveyors of the coast or the public lands. area of Florida which had been his home for several years. omitted when they do exist, or are misplaced. some advanced civilization had formerly resided there. of the tradition that the missions were "forts." colonization had spread as far south as Charleston by 1680.
inventions in his View of West Florida. productions of the land. His section called "Productions"
delicate and difficult to raise. manufactures will ever be greatly extended in this country. and groceries and provisions from New Orleans. lar to those which had been observed in old St. Augustine. of the material authored by Williams deals with history. work, admittedly "more copious than was at first intended,"
indebted to each other for their knowledge of Florida. of Florida was published in New York by A. T. Goodrich. 1. John Lee Williams, A View of West Florida (Philadelphia: H. S.
North American Review 26 (April, 1828): 483. 1921" (University of Florida Ph.D. thesis, 1955), pp. 39-40. Government Printing Office, 1956), p. 877. 5. Florida Historical Quarterly I (April, July, 1908): no. 1, pp. 37-44; no. 2, pp. 18-29. 6. John Lee Williams, The Territory of Florida (New York: A. T.
to learning. He was United States Judge for West Florida. (Washington: Government Printing Office, 1946), 231n. 12. Williams, View of West Florida, pp. 33-34. 17. Gannon, Cross in the Sand, p. 69. 19. Williams, Territory of Florida, p. 175. 20. Williams, View of West Florida, p. 69. 23. Gadsden in North American Review 26 (April, 1828): 493. 24. Carter, Territory of Florida, 24:402, 592, 601, 682, 816. 25. Williams, Territory of Florida, p. vi. THE ENTRANCE OF THE HARBOUR. San Appendix, treating of its Antiquities, Land Titles, and Canals. And con.
" entrance of the Harbour. By John Lee Williams." designing, engraving, and etching, historical and other prints." something useful to practical men. als, which are withheld from sale for the purpose of speculation. will appear in a more systematic form. ments, which the author felt unwilling to omit. PaIL oz~LtAu, MaTrch 5th 1827.
plied to territories very different in location as well as in extent. river; thence eastwardly on a direct line towards the head of St.
16,500 square miles, and 10,560,000 acres of land, with a popular. tion of from eight to nine thousand inhabitants. mate is healthy and the seasons mild. brown sand, alternating with white cliffs and sometimes with "
rally covered with grass and rushes for several miles into the sea. alluvial. The substratum is a clay of various colours-white, yel. sula, but it is yet too tender for building. pregnated with lime, and are not generally considered healthy. fina river, seven miles, above the head of St. Andrew's bay. nucleus. It becomes hard on exposure to the air. The flint is of. nuclei form extensive and very rugged reefs. The fort of St.
and they are very hard to separate from it. from exposure to the mild sea breezes of the Southern gulf. in a warm climate; and these line our seacoast, from the St.
correct the evil, time will discover. been attended with agues and bilious fevers; except these, . have heard of no diseases peculiarly incident to the climate. time that dreadful disorder occurred, was in the year 1822.
the town was filthy in the extreme, and overrun with strangers. prevent the recurrence of a similar calamity. or seven miles into the country, where it ends in a small river. ion of those gentlemen on the subject. the harbour, against an unfavourable wind. from the west, except that they may safely run in five fathoms. course till he was W. one-fourth S. from the old fort on St.
over and thrown considerable sand on the bar. bayou is a pleasant, healthy, and safe harbour for small craft. wide, and four miles in length. The Bayou Mulatto enters the east side of Escambia bay. vessels may carry eighteen feet water, to Little Oyster point. water gradually shoals to seven feet. of the peninsula, which forms St. Joseph's, is the Cape St. Blass. seen at a great distance. should be directed into some other channel. feet water is now found on the bar. islands; here the channel is about a mile wide, and easy of access. circular form, round the entrance of the bay, almost to St.
extensive bars, covered with large and excellent flavoured oysters. The Ocklockney' bay is twelve miles long, and two broad. than four feet water can be depended on at low tide. may be carried up nine miles to the falls. is deeper. This is the easternmost bay in West Florida. that distance from the shore. three miles from this shore. island, vessels may anchor in perfect safety, close along shore. A ridge of low sand hills extends along the west side of this island. have been separated by some late eruption. shoal which stretches west from the centre of Hummock island. enter the bay, pass close to the north-east point of Sand island. ern shore is marshy and broken by large lagoons. lagoons. On this side, the island seems to be increasing in size. The east end is low and barren. and one and a'half wide. It is similar in- surface to St. George's. with great force between them. bay. It is twenty miles long, and from five to twelve miles wide. est cane lands in the territory. mills, which have done considerable business. are, Sepulgas, Murder creek, the Big and Little Escambia. there is very good land in small bodies, some of which is settled. where the United States' road crosses. the natural bridge, a large stream bursts from the base of a gen "
an arm of the Appalachicola has lately burst into the Chapola, ant? The Appalachicolar is formed by the junction of the Chatta. the sea. To this place considerable sized schooners have sailed. which' it enters among numerous low marshy islands. land, in thle heart of Gadsden county. oftheWakully and St Marks rivers; it is only nine miles to the sea. to its source, which is eleven miles and a half north-west from St.
the earth for a considerable distance. which enter the gulf east 'of Oscilla, but they are little known. bar at its mouth, would be of great importance in navigation. meets the Santaffee; it then turns a south-west course to the sea. discovered, just below Ouithlacouchee, on the western bank. fields remain covered with peach trees. outlet communicates with the Ocklockney'river. was situate on the south shore; here are extensive peach orchards. It is three miles from east to west, and about.a mile wide. miles long, and two or three broad. in the country, being twenty miles long and seven broad. brought from Andalusia by the Spaniards. them; they even seem to prosper best, when neglected . Racoons and skunks are frequent in the interior. Salamander is a large mole, about half the size of a rat. It pene. boes, made of their flesh, are much esteemed. They are a harm. them to hatch by the heat of the, sun. mother, in the adjoining wallow. old inhabitants call him the scorpion. The northern blue tailed lizard is sometimes, but rarely, seen. quently seen, and has much the contour and manners of a dandy. selves by wading in muddy creeks. brown, red, yellow, 'afd white, in rings of about an inch long. up the account of this species, in West Florida. lion, and his barking imitates, to perfection, the voice of a puppy. skin, it is very difficult to expel them. not done, they will continue painful eight or nine days. summer season, should carry a bar with him. list of those birds which are most common. Black and white. P. pubescens. Black Wood Duck. J./ nig. ces. Fort St. Lewis was situate two miles west of Tallahassee. again awakens the echoes of the distant hills, on days of rejoicing. Many articles of old iron have been discovered about this ruin. with a more recent forest. manufactured arms, as well as other articles, for the world. Mr.
perfect in form, but very tender. near this place, by the English. tification. The bank is two or three hundred feet high; it com. which, has long been a subject of wonder to the Indians. great springs, and natural bridges. miles west of the ferries on Chapola river, in Jackson county. of red clay, covered with the debris of the decomposed rock. dark recesses, with a roaring sound, like heavy wind. two water courses, one of which bounds the passage. sition; the centre irregular sparry crystals, of a yellowish hue. in some fathomless cavern, abandoned his work. of access, than the former; it is, also, more spacious within. same, and there is no variation of ground. it is narrow. The United States' road, from Pensacola to St.
suspecting that a river existed near them. is similar to a clear sky; except, that the reflection of the surround. of the whole scenery, renders this a charming spot. divide the opening in two parts, at some depth below the surface. all is calm unruffled quiet: here all is life, activity, and animation. fountain; it is peopled with a great variety of fish. there, by Mr. Cummins, a merchant from Philadelphia. of them, however, have been analyzed. These vary, according to the soil on which they are produced. banks of lakes and lagoons. the southern states; and also produces turpentine and tar. Oak, high willow. Quercus cinera-on barren hills. Andromeda. A. rigida--on the edges of savannas and streams. Shallow Cup. Quercus pumilla-round the borders of hammocks. Live-oak shrub. Q. maratima-near the sea coast, very fruitful. often bent to the ground with acorns, excellent for swine. Hickory grubs. Juglans tormentosa-the better kind of barrens. Haw, summer. C. flava--sea islands and dry plains. C. apafolia--edges of savannas and streams. Azalea. A. Bicolor and nudiflora, do. do. Whortleberry. V. staminium-dry ridges, berry larger. Blueberry. V. frondosum-damp flat plains, berry blue. Wild Sunflower. Helianthes atranubus-pine woods. Wild Pennyroyal. A. pugloides, do. Wild Mallows. Hybiscus scaber, do. Wild Indigo. Baptista perfoliata, do. any other of the species. Balsam Cuphilla. C. viscossima, do. Scull cap. Scutelaria villosa--pine woods. Asclepias connivens-sandy plains and sea islands. Sensitive plant. Mimosa sensitiva, do. Nightbelle. Ipomea bona nox, do. Sand Lilly. Convolvulus spithamacus-dry plains. C. obtusilobus, do. and sea islands. Yellow Jessamine. Gelseminum sempervirens-dry plains. the herdsmen, accordingly, fire the barrens, at regular seasons. Twisted Xyris. X. flexuosa-flat grounds. Rough-head Fuerina. F. squarosa---fat grounds. quently to the depth of five feet. S. exaltatus, do. grows to a great height-ten feet. White button. Duchromena leucocephala-wet barrens. Cockspur. Cenchrus tribuloides-old sandy uncultivated fields. Low cane. Arundinarea tecta-around spring heads. Smooth Panic grass. P. lavigatum-ridges. Broad-leaved Panic grass. P. latifolium-pine woods. ought to be cultivated: these in dry, that in wet soils. ever there is calcareous matter in the soil. A. juncea-sand hills, not fit for hay. Purple Aristida. A. spiciformis, do. Woolly do. A. lanosa, do. do. A. purpurea-stem coarse, few leaves. Broom Grass. Lateralis-tall, coarse, and often used for sweeping. Purple Aira. A. purpurea-sea islands. Hairy Poa. P. hirsuta-old fields. Green do. P. viridis, do. Rough do. P. rigida-pine woods. Purple do. quinquefida-makes excellent hay. Oat grass. Uniola paniculata-sea islands. Slender Fescue. Festuca tenella-barren plains. F. nutans-most common in the barrens. Crows Foot. Eleusine indica-old fields, an exotic probably. and tender. The root is bitter, and affects the salivary glands. White. Q. alba-the most useful tree in America. Thick shelled do. J. sulcata. J. tormentosa-the common Hickory of Florida. White do. M. alba, or pubescens. Plumb, red and yellow. Prunus chicasa. Anona. Asimina triloba, or Pawpaw. White Locust. Robinia pseud acacia. White Fringe tree. Chionanthus virginica. Hydrangea. H. Nivea-on limestone rocks. rated; but such as are peculiar to the hammocks will be noted. and healthful beverage. Cattle eat the herbage with avidity. Cabbage Palm. Chamarops palmetto.-The greatest ornament..
islands; not seen farther west than St. Andrew's bay. Sweet Gum. Liriodendron styraciflua-rivers, hammocks. a cherry, usually grows near streams, ten feet high. yellow, and tastes like custard. on the sea sand; excellent for hedges, and ornament. Star of Bethlehem. Hypoxis erecta. they are not exotics naturalized. and most healthy herb, especially in scorbutic affections. also a good wine grape. this vine are much admired. Yellow Bell Flower. Convolvulus obtusilobus. waters from draining off, as the surface of the rivers subside. them are frequently impregnated with sulphur, vitriol, and iron. andromedas, loblolly and other laurels, vaccinums and vines. Pine barren do. C. imbricarea. Swamp Poplar. Populus angulata-river swamp. Whahao. Ulmus alata-high pine barren. Soap Tree. Sapindus saponaria, do. near the coast. Winter Plumb. Prunus hiemalis, do. back from the coast. Buttonwood. Cephalanthus occidentalis-near the coast. Strawberry Tree. Euonimus americanus, do. Swamp Haw. V. nudum, do. Sambucus. S. canadensis-deep inland swamps. .Laurel. Laurus millisafolium, do. and in galls. small streams cool for a great distance from their fountains. often hang on the bushes till winter. Bird Shot. Canna indica-river swamps. Yellow do. G. aurea-pine barren swamps. Hairy do. G. pilosa-near swamps. Round Fruit G. sphaerocarpa-lake shores, and savannas. Round Micranthemum. M. orbiculatum, do. Floating Utriculare. U. inflata, do. in still water, fresh. Purple do. U. saccata, do. Yellow do. U. longirostrus, do. Small do. U. biflora, do. Narrow-leaved Lycopus. L. europius, do. Sallop-leaved do. L. sinuatus, do. Blue Tripterella. T. coerulea, do. Three-petaled. I. tripetala, do. rare. Blue. I. hexagona-rich river swamps. Creeping Comelina. C. communis, do. Blue do. C. longifolia, do. Moss-leaved Syena. S. fluviatilis-bay galls. P. pectinata do. and savannas. Three-leaved Galium. G. trifidum, do. C. paniculata, do. and swamps. Potamogiton. P. pinnatum-stagnant fresh water. Phlox. P. divaricata-low river swamps. Cardinal flower. Lobelia cardinalis, do. beautiful scarlet. Pinckneya. P. pubens-galls and savannas. Swamp Milkweed. Asclepias parviflora, do. Wampee. Pontederia cordata-galls and savannas. Cats Tail. Typha latifolia, do. Soft Rush. Juncus effusus-galls and savannas. Blue Scull-cap. Scutelaria laterifolia-swamps and galls. P. persecaria, do. and ponds. Sarracena. S. purpurea-swamps, galls, and savannas. Cyamus. C. luteus, or Yellow Water Chesnut, do. Polygala. P. lutea-ponds and galls. Winged Dolichos. D. luteolus, do. Aromatic Liatris. L. odoratus-galls and savannas. Purple Veronica. V. oligophylla-edge of swamps. Slender Aster. A. carolinianus, do. Yellow Bidens. B. coreopsis-ditches and galls. Bristly Typha. T. latafolia, do. Orchis. 0. ciliaris, do. and galls. Dolychos. D. luteolus, do. near salt water. Grape. Vitis labrusca-in all swamps. Smilax. S. pastata, do. every where. Smooth Briar. S. bona nox. lanceolate, ovate. Common petiole three to five inches long. Legume wrinkled,*one to three seeded, most frequently two. Rhynchospora. R. cymosa-galls and savannas. Spanish Grass. C. virens, do. Yellow Cyperus. C. flavescens, do. S. validus-in lakes and ponds. Dichromena. D. ciliata-margin of ponds and swamps. A. tecta-edge of swamps and marshes. Leersia. L. oryzoides, do. inland. Phalaris. P. americana, do. fresh and brackish. Early Paspalpum. P. precox, do. Large Spiked Panicum. P. italicum, do. Water Panicum. P. geniculatum, do. Aira. A. palustris-swamps and savannas. Awlwort. Sibularia aquatica-river swamps, and wet sea beach. covered with a very thin soil, and are of course quite barren. C. repens, do. near the mouth of rivers. Marsh Rosemary. Statice limonium-salt marsh near the shores. Cardamine. C. pennsylvanica-salt-near the sandy shore. Pistia. P. spathulata-brackish-mouths of rivers. Arum. A. virginicum, do. and fresh. Iresine. I. celosioides-salt and fresh. Large Marsh. S. lacustris, do. Salt Rush. S. spadiceus, do. Downy Flower. S. ferrugineus, do. Eriophorum. E. virginicum-fresh-in boggy clumps. White Rush. Spartina juncea-salt-forming also tufts. Salt Marsh Grass. S. glabra-salt. Soft do. P. molle, do. Sea-shore do. P. virgatum, do. acea is not eaten by either. herl long, of a silky lustre; the colour a glossy yellowish white. inches long: these are turned by a crank with the hand or foot. into Georgia by a Dr. Turnbull. is easier to kill the weeds among rice by water, than by the hoe,. yet that if is no more essential to the growth of rice than of corn. a barrel of flour. It preserves much better in a warm climate. certain crop, and much more profitable. ton, and purchase bacon and flour. hundred and sixty dollars from that same acre. The Otaheite cane has been principally cultivated in Florida. In Louisiana, the riband cane is likely to supersede all others. This species of cane was introduced, only six years ago, by Mr.
decay: it will succeed on much poorer land than any other cane. this climate, the best substitute for bread, that exists. or some compost, to shield its roots from the rays of the sun. Florida: its natural soil is the pine barrens. produce profitable crops on any of our lands. tables, during the summer season. peninsula, occupied by judge Brackenridge, opposite to Pensacola. pruned, any quantity might be raised with a trifling expense. fully the third year after planting. the woods to the garden, they have been greatly improved. gustine, have been known to produce six thousand in one year. side of the grove next the sea, to break the force of the storms. fruit and the peel are the only parts used. attaining, it may become, in all respects, the most estimable fruit. dagger, (yucca draconis,) the hedge would be also formidable. cultivation may be one reason for the difference. succeed better on the clay uplands, at a distance from the coast. post, forms an excellent nianure. domestic clothing, made by the planters for their own families. myrtle wax, quercitron bark, sumachh, benne, and palma christi. "70 VIBW OP ,WST FLORIDA. suits offer better prospects of success than this. from New-York: provisions ahd groceries from New-Orleans. dkins and horns, beeswax tallow,-hides, peltry, and bricks. credulous, and to extort rewards for alleviatifig their fears. or the lower world, Ucupacha; and Cupai the evil spirit. used leggins and mantles of fur. Florida, and joined the Seminoles. ga, and Mickasuky, besides several 'nbr settlements. attained a considerable degree of civilization. hundred feet from east to west, by nine hundred north and south. Most of'our principal buildings were erected during this period. Cassa Blanca, have since been burnt down at different periods. are still to be seen, overrun with weeds, bushes, and vines. which blew it up. From this period it appears to have declined. eaci five hundred feet long by three hundred broad. against us, in open violation of the professed neutrality of Spain. left'it in the hands of the Spaniards. soon given up, and the Spanish authorities reinstated. suffered to go to ruin. ill calculated for the purpose to which it is now appropriated. bench, at the foot of the square of Ferdinand. this building has also been repaired by government.